The Ukrainian National Museum is unveiling a significant exhibit “Apostle of Peace” which celebrates the 150th anniversary of Metropolitan (Archbishop) Andrey Sheptytsky’s birth. This exhibit honors his contributions to the Roman Catholic and Ukrainian Greek Catholic Churches, his philanthropic accomplishments for youth and the arts in Ukraine, and his humanitarian deeds sheltering those sought out by Nazi persecutors. For his exemplary life, it is anticipated that Metropolitan Sheptytsky will be canonized into sainthood. 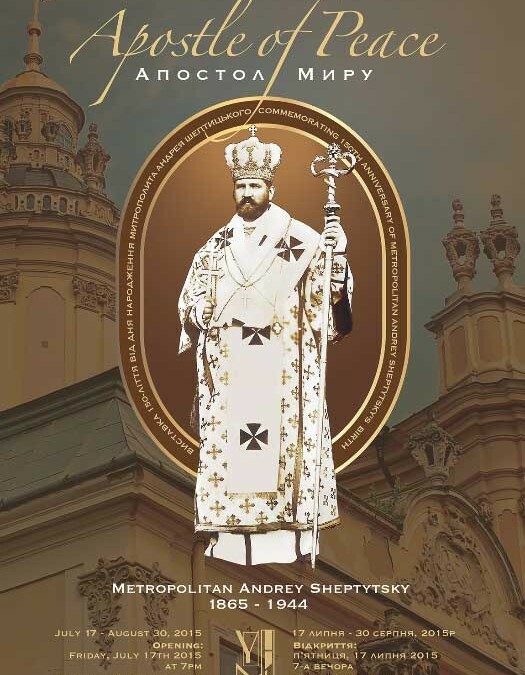 The exhibit will present information about Andrey Sheptytsky, who was the Metropolitan of the Ukrainian Greek Catholic Church in Ukraine from 1901 until his death in 1944 and considered the most influential figure in the entire history of the Ukrainian Church in the twentieth century. Additionally, the Ukrainian National Museum’s collection of personal letters, relics and other artifacts owned by Metropolitan Sheptytsky will be on display. Reverend Doctor Ivan Kaszczak, author of Metropolitan Andrei Sheptytsky and the Establishment of the Ukrainian Catholic Church in the United States will speak about the Metropolitan at the exhibit’s opening. The presentation will be in English and Ukrainian. All are invited to the Ukrainian National Museum’s exhibit “Apostle of Peace” opening Friday, July 17th at 7:00 PM. Reception will follow. Admission is $10.00. This exhibit will be on display through August 30, 2015. Sponsors: Selfreliance Foundation, Heritage Foundation Assurance Agency, Ltd, MB Financial Bank, Ukrainian Catholic Education Foundation, Kasia’s Deli. The Ukrainian National Museum is located in the heart of the Ukrainian Village, at 2249 West Superior Street. Hours: Thursday through Sunday, 11 AM to 4 PM. Admission: Adults $5.00, Children under 12 free. Parking is available beside the Museum and across the street in the church parking lot. Visit the Museum’s website or call 312.421.8020 or email info@ukrainiannationalmuseum.org for more information.